Sarawak business entrepreneur Datuk Seri Mahmud Abu Bekir Taib today continued his testimony in the Shariah High Court of Kuala Lumpur in a re examination by his counsel, testifying that an international politically motivated conspiracy had evolved from his divorce maintenance hearings against him and his family, in particular, his father Tun Pehin Sri Abdul Taib Mahmud, Governor of Sarawak and immediate former chief minister of the state. “What was suppose to be a private matter in divorce maintenance claims before the courts was blown up into an international attack and slander to change the political landscape of Sarawak. To add spice, my wealth was grossly exaggerated and misrepresented,” he said. Shahnaz claimed that he had a string of offshore bank accounts in Canada, the US, the Caribbean, France, Luxembourg, Monaco, Hong Kong and Switzerland, he said. She also testified that her former husband had properties both locally and abroad. “This court has not been shown any evidence and proof that these accounts exist. Neither have these off shore banks been called in to testify its existence. These bank accounts are forgeries masquerading as hacks. They are not real,” he told. Mahmud was referred by his counsel to a news release he had issued in September 2014 in which it was reported, “The forged documents were obtained by my former wife and her team at a time when the fraudsters were running away from the arms of the law. The fugitives took refuge at Turks and Caicos Islands in 2010 where they continued to dupe clients in an international scheme that involved bogus promises of offshore millions. On 10 April 2013, the fraudsters Cullen Johnson and Elaine White were extradited to the US from a Turks and Caicos prison on charges of money laundering, tax evasion and several charges of fraud valued at over US$1 million. Johnson and White were caught and arrested by the FBI. They have now been indicted and jailed. He said it has been widely reported on the Internet that Sarawak Report political activist Clare Rewcastle-Brown had been in communication with Cullen Johnson. 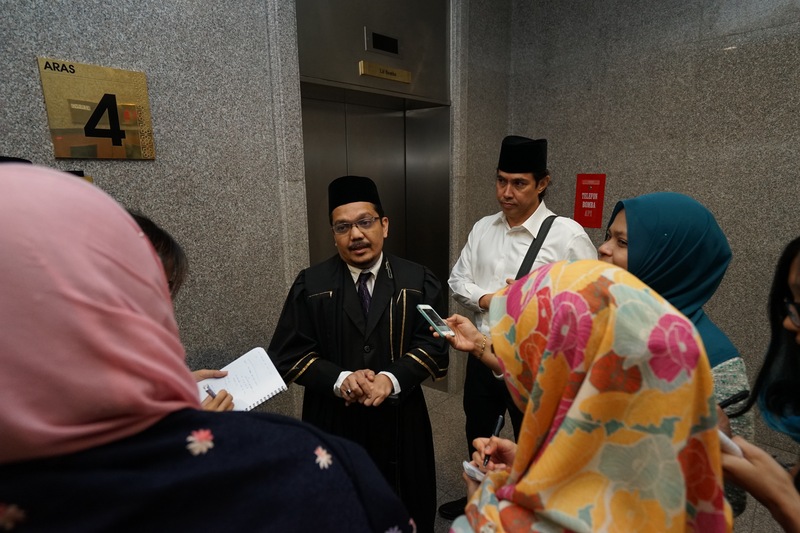 Datuk Seri Mahmud underscored this testimony at the Kuala Lumpur Shariah High Court today before Judge Muhamad Abdul Karim Wahab in the ‘mutaah’ divorce claim by his ex wife. Lawyers acting for Mahmud were Datuk Zainul Rijal Abu Bakar and Saadiah Din. On claims that he had assets amounting to RM1.3 billion, Mahmud told the court that the report by his former wife’s appointed audit firm Ferrier Hodgson MH was not credible. The auditors had not written to him nor to the company secretaries of the companies he had shares in, to determine his true wealth. “The report had also failed to take into consideration my liabilities and loans taken by my companies in their assessment. The court was earlier told that the pair had divorced on 11 May 2011, twelve years after several attempts to divorce amicably, could not be reached. Living separately since 1999, Mahmud had provided Shahnaz RM15,000 to RM20,000 a month as well as a bungalow residence. Mahmud also testified that he had been attentive to his son during the separation with his former wife. In addition to the RM100 million for conciliatory gift (mutaah) claim today, Shanaz had also filed a number of other claims amounting to RM500 million for matrimonial assets division, and RM141 million for child maintenance to include a terrace house in London (RM60 million), two Aston Martins (RM5.5 million), and a private trust fund (RM40 million to be held by her). “The court needs to hear how Shanaz and her team commissioned and obtained forgeries from fraudsters who were subsequently indicted and jailed as well as determine the credibility of the report by Ferrier Hodgson MH,” said Datuk Seri Mahmud. Hearing continues on 27 August 2015.